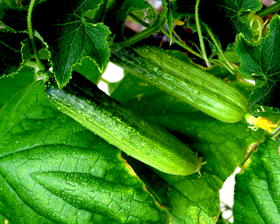 An early ripening and prolific cropping gherkin type cucumber, producing short, firm fleshed, tasty fruits ideal for pickling, or used in salads. Has both downy and powdery mildew tolerance so the healthy plants produce fruits over a long season. Sow March-June to grow indoors or April-June for outdoors. Sow seed 13mm deep in 75cm pots of good seed compost. Place in a propagator or seal container in a polythene bag and place at 21-25C until germination, which usually takes about 7 days. Can also be sown direct outdoors once the soil has warmed and all risk of frost has passed, 2cm deep 70cm apart and in rows 70cm apart.